Why did you get involved in the planning of the Boston Jewish Food Conference initially? 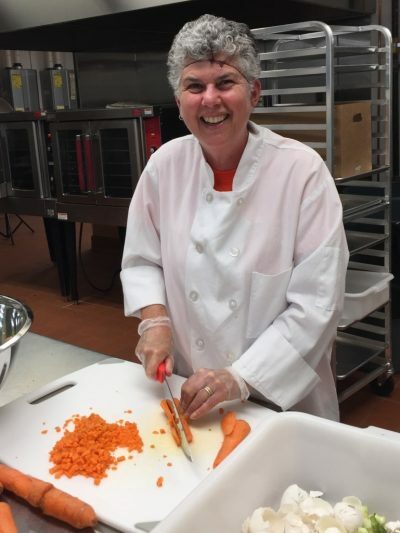 I had recently made a career change and gotten involved volunteering and then working at Daily Table, a not for profit Grocery Store in Dorchester. I had heard about the Food Conference, and in 2016 there was a session on food recovery. Since food recovery is something of particular interest to me, I this was the motivation that I needed to finally attend the conference and learn more. It was called “Farms, Food Rescue, and Supplying our Food Pantries with Family Table (JF&CS), Lovin’ Spoonfuls and Abundance Farm. I enjoyed all of the sessions that I attended. The community dinner was the cherry on the top! What brought you back to this year’s planning team? I love food and I love being Jewish – the conference is the perfect match for learning more and interacting with Jewish people who are also passionate about food. It amazes me each year the diversity of issues covered and the incredible speakers that share their passion and knowledge. What are you most excited about in 2018 conference? Each year the conference explores different areas of food issues, it is exciting to hear from new people and learn about other connections that we can make to food and our community. Are there other similar organizations you’re involved with? As I have gotten more involved in working on food related issues I have expanded my involvement; joining the planning committee of the Boston Jewish Food Conference, as well as the board of the Newton Community Farm. Most recently I became a commissioner of the Solid Waste Committee for the City of Newton. Newton just started a pilot organics collection and it is extremely important that we include proper disposal of our food waste in our daily lives. When did you first start learning about injustices in our food system? I was raised in a typical Jewish household where the dinner table was an important part of our lives. We came together each night, sharing food and stories from our day. Food was prepared with love and was cherished – I don’t ever remember food being thrown out. My mom was the queen of repurposing food. We hosted often despite having a small space for company. The couches got moved, the TV went into another room and a folding table was set up. My mom experimented with International meals as well as themed dinners. I was surprised to learn that not everyone had this same respect and care for what they ate. What Jewish values or traditions underlie this work for you or speak to you most? Bal Tashchit – the commandment that encompasses respect for the environment by not destroying or wasting resonates with me deeply. I do what I can on a daily basis to respect the environment. At my work at Daily Table I am known as the go to person for questions about ways we can repurpose food that we can no longer sell. It is important to respect our environment and value the limited resources that we have. Will we see you at this year’s conference? Join us to grow our relationship with the land, and with each other.